I’m back at my desk in Bristol after some adventures in Scotland, gaining more experience of the sea, of boats, and of pushing my boundaries. I spent some time on a 38ft yacht sailing around the north-west of Scotland with seven other people. 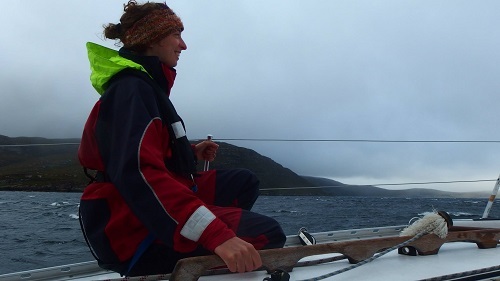 It was pretty windy with some nice chunky waves: on our first day out at sea half the crew was seasick. I was one of the lucky ones, although admittedly I did feel queasy at moments, particularly after struggling with all my layers, foul weather gear and lifejacket in the pitching and heaving little toilet down below. As I was repeatedly thrown against the walls while attempting to flush the loo (put the lever to the right and pump everything away, push it over to the left and pump fifteen times to flush, put it back to the right and pump to once again empty everything), I was quietly grateful that I’ll have a nice simple ‘bucket and chuck it’ system when I’m rowing. As long as I don’t ‘chuck it’ into the wind I should be fine! I did enjoy the wind and the waves though – the sense of being alive out there is very acute. I also found myself wildlife spotting, and was ridiculously excited to recognise a gannet. Reminder to self to take relevant bird and marine life books with me on the row. Getting some sailing experience was a really useful part of my preparation for the row, and I’m looking on it as important training. My boat will be less than two thirds the length of the yacht, and I will be on her for around three months in a huge variety of unpredictable conditions. I won’t have the comfort of having people around, but nor will I have anyone else to worry about while I’m out there. Much of what I learnt in Scotland will be consolidated on the RYA courses that will be forming part of my training this autumn. Remote north of Scotland. The mast of the yacht is just visible beneath the ridge. Unfortunately, I had to leave the trip a little earlier than expected, meaning that my booked train tickets were useless; getting home became an extension of the adventure. I was dropped ashore on some rocks, and had to climb up them and over some rough fields before I found anything resembling a road. Although I was less prepared than I’d like to be on finding myself alone in the middle of nowhere, and had no idea how long it would take to get back, I felt a huge surge of freedom and excitement as I struck out on my own to attempt to find a way back. After scrambling, walking, and then climbing a couple of fences, I caught sight of a car and asked for directions to the nearest A-road. 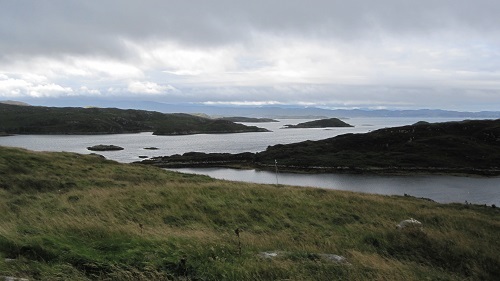 The driver very kindly gave me a lift to the next hamlet – her husband was in the process of hiking the coast of Scotland and she was supporting him, so had a little time to spare. From there I had some extraordinary luck with lifts – a couple on their way back from holiday, a Dutch businessman, and two lorry drivers. All of them were really friendly, kind, and interesting to talk to, and I made it back to the centre of Bristol in record time – less than fourteen hours from the very north of Scotland! By the time I got back I was exhausted, having barely stopped on the way down at all, but also strangely exhilarated. I hadn’t really hitched on my own before, and certainly not at night; the whirlwind journey back pushed my boundaries just as much as the bumpy sailing of the preceding days, and stretching those boundaries is half of what I need to do right now. Beginning the second part of the adventure! 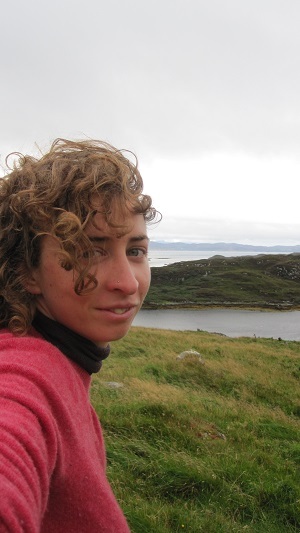 I’m amassing a huge amount of advice from past ocean rowers and adventurers – some of it taken from books, some from blogs, and much from one-to-one meetings and conversations. One of the biggest pieces of advice I’ve had on how to make sure that my row is a success is to keep pushing my boundaries and keep putting myself in uncomfortable situations. What I go through on the row is sure to be more painful, more extreme, scarier and bigger than anything I have yet faced, but the greater the pool of experience I have to draw on, the greater the reasons to believe in myself when things get difficult. On that note, I’m running a half-marathon tomorrow. I’m not a runner in any sense, but am also sure that it will give me yet another piece of useful experience to add to the collection! Stay tuned for news of how I do (also for photos from sailing, and exciting news on the soon-to-arrive swanky new website! ).